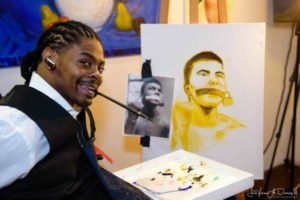 The mouth painter Antonio Davis from the USA was recently invited to the “Steve Harvey Show”. Steve Harvey is an award-winning comedian and talk show master in the USA. Antonio Davis discussed the joy he feels in his voluntary work – especially his work with children and the promotion of artistic expression. Thanks to his commitment, Antonio was also contacted by the Obama Foundation and was even honored to meet former President Barack Obama in person. His professional development as an artist is one of the reasons why he was invited. Antonio presented an original portrait to former President Barack Obama. Barack Obama was also impressed with his story and artworks in which he introduced Antonio to the „Obama Foundations Original Series Active Citizens community Leaders“. Antonio’s goal is also to open a non-profit Community Art Center. To support under Served communities with a cultural nutrition that will benefit all Citizens. Antonio Davis believes that art has the power to change life and to inspire young people never to give up their dreams, despite all the adversities.